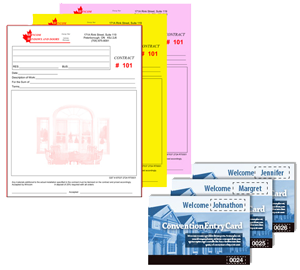 Multipart Forms (sometimes referred to as NCR or Carbonless Forms) are ideal for handwritten quotes and invoices when more than one copy is needed, especially when Hand Drawn details are also needed to be recorded. Many sizes are available and they are completely customizable with your business information including your logo. "Variable Printing" refers to printed items (such as postcards or flyers) with the main body of the artwork being the same on each item but with "reserved" sections where independent individual information can be printed (usually text such as name and address).